Seventy women attended the first Women in Public Service Symposium in Murfreesboro, Tennessee, November 13, 2014. The Municipal Technical Advisory Service (MTAS) and the County Technical Assistance Service (CTAS), both divisions of the Institute for Public Service at the University of Tennessee, presented an empowering six hour session to afford women in public administration the opportunity to develop their professional expertise, enlarge their network of professional friends and expand their goals in life. The participants were able to listen and learn from several prominent women speakers from various walks of life, who have dedicated their lives to public service. Each speaker provided a vast wealth of knowledge in preparing the current and upcoming generation of female leaders. The day started off with well-known public speaker and consultant Dr. Susan Williams. Williams, emeritus professor of Belmont University, spoke to the women about becoming more engaged in the workplace. During the second session, the class heard a panel of three inspiring women: Kim Harmon, a special agent with the Tennessee Bureau of Investigation’s (TBI) Training Division, Felenceo Hill, who currently serves as fiscal director for the Tennessee Department of Finance and Administration and Nneka Norman-Gordon, the higher education resource officer for the Tennessee Comptroller of the Treasury. These three women shared their personal stories and their ideas of how to make a difference in public administration. The mood lightened during the third session as comedienne and East Tennessee native Leanne Morgan shared her story through her comedic routine. The day wrapped up with Mimi Bliss, who provided media spokesperson training and presentation coaching for professionals and organizations nationwide. During this interactive session, Bliss wanted the female leaders to share their stories as inspiration for other women looking to lead. For several years now, I have been intrigued by research literature addressing the topic of women in public service and their various levels with public sector engagement. Although I would argue there is a disparity in research on this particular topic, the literature that is available is both insightful and thought provoking. For example, I first began contemplating the need for additional studies and venues to promote women in public administration after reading the research of Condit and Hutchinson (1997). Their study showed an underrepresentation of female colleagues submitting research articles in public administration journals. Most recently, I was challenged by the research conducted by Maria J. D’Agosotino. The premise of her research pertained primarily to the differences gender brings to government entities. As I shared my desire for putting together such a venue to my peers and leaders, everyone embraced the concept and was willing to make the event a success. It was truly gratifying to see the networking and challenging discussions that were happening during the symposium. 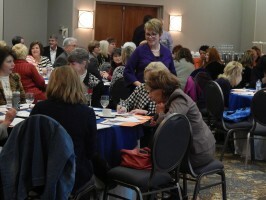 Participants were heavily engaged and supportive of one another throughout the day. It was very encouraging to observe. The female participants came from a wide variety of agencies, representing numerous cities and counties across the state of Tennessee. Some participants commented about what they liked most about the event. A second symposium has been scheduled this year for Nov. 12. Event planners are projecting twice the number of participants due to the positive feedback they have received from those who attended this event. Author: Patrick Mills serves as administrative specialist in the Training Department of the Municipal Technical Advisory Service (MTAS), an agency of the University of Tennessee Institute for Public Service. Established in 1949 by the Tennessee General Assembly, MTAS provides technical advice and training to cities and towns across the state: their governing bodies, mayors, city managers, city recorders and city department heads. Mills can be reached at [email protected].